Koi Element E-Liquid. Koi Element E-Liquid wholesale and retail from Official Aspire UK. The Koi E Liquid range from our friends at Element E-Liquid is something to behold. Do not let the term Japanese Desserts turn you away, these flavours are familiar and yet have the perfect twist but trust us they are all simply devine. 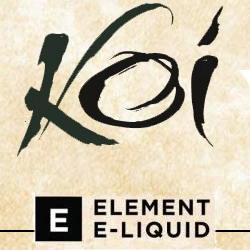 Koi Element E-Liquid wholesale uk is available direct from ourselves as one of Element E-Liquids trusted sub distributors. Speak to our team for trade pricing. Supplied in a 60ml bottle containing 50ml of Koi Element E-Liquid. Nic shot ready and bursting with flavour this range is a must stock for your customers. The mix ration is a standard 70/30 High VG mix and will vape perfect in one of our many Aspire Sub Ohm tanks. Koi by Element E-Liquid is available now both wholesale and Retail from Official Aspire. Castella by Element E Liquid Velvet Soft Sponge cake and extra light soft Vanilla on top. Ele..
Sakuramochi by Element E Liquid Delightful Ice Cream with Black Cherry sauce served up in a 60ml..
Yatsuhashi by Element E Liquid Finally a juice company has gotten Rice Pudding just right and no..
Yuzu by Element E Liquid Classic Lemon Meringue with some awesome Yuzu to give it the edge all s..